KANSAS CITY, Mo. 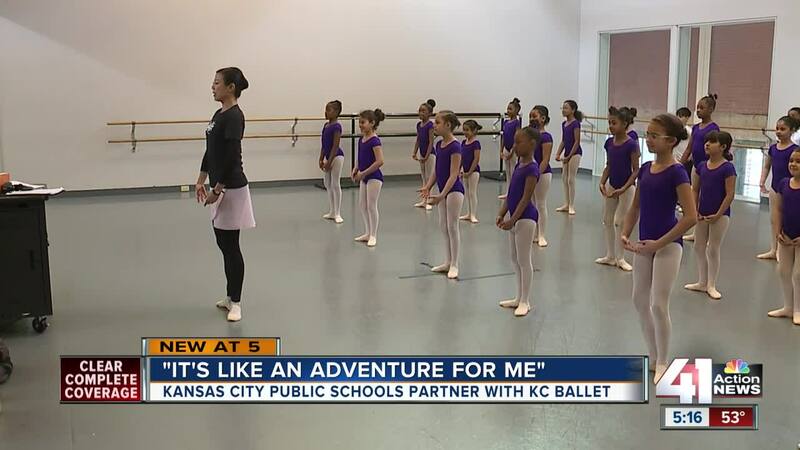 — The Kansas City Ballet and Kansas City Public Schools are celebrating a new movement improving student achievement. The two groups are partnering in a program called ROAD, which stands for Reach Out and Dance. They say it's a creative way to help students unleash energy, embrace creativity and learn practical life skills. April Berry, director of community engagement and education at the Kansas City Ballet, said the ROAD program has two components. During the fall semester, ballet dancers and instructors visit students in several KCPS schools and take them out of the classroom to spend time learning ballet and jazz dances. The second component of the program involves taking students out of school to train in dance at the Bolender Center for Dance and Creativity. Instructors this year identified more than 60 students from the almost 500 students in schools who demonstrated skills and a greater interest in learning dance. KCPS transports the students to the Bolender Center, and the Kansas City Ballet provides those students with dance attire, ballet shoes and caring instruction. Students in the advanced training classes have the opportunity to audition for ballet productions. That student and their parents also get tickets to a ballet performance. Students enjoy getting a break from school for a chance to realize their dreams. Edgar Barajas, a third-grade KCPS student, called dancing an adventure. "It feels really good because you get to dance and have fun at the same time,” Edgar said. Aubri Tanner, another third-grade dancer at the Bolender Center, said she's enjoyed dancing since she was 3 years old. "I learned that you can be kind and learn how to dance different and things," Aubri said. Berry said the skills these students learn in the ROAD program can translate to many areas of life. "They may become a professional dancer, they may not, but these skills in dance will serve them if they become a lawyer, a doctor, a judge, a teacher, a principal, because they will carry themselves in a certain way after having dance training," she said.